The combo of the lake and mountains is almost too spectacular. See who's game, grab towels and meet by the door in five. The weather doesn't have to be officially warm to sit outside - "warm-ish" works just fine if you're still in your ski gear. Even top-your-own-chili night feels fancy in this kitchen. It's that spectacular. Grab your tablet or a newspaper and find a seat by the fire. It's a 9-minute drive to the base, or a 20-minute walk to the Quicksilver Superchair. There's an on-call shuttle to the Gondola too. You're an 8-minute walk from all the shops, bars and restaurants on Main Street in downtown Breckenridge. Lake and mountain views make this a spectucular venue for your destination wedding. This resort has seven hot tubs. What are you waiting for? Hiker alert: Spruce Creek Trail is a 10-minute drive away. You're a 13-minute drive from Breckenridge Golf Club. Load up the clubs and you're on your way. With its enviable Main Street location, surrounded by a woodsy preserve and the rushing Illinois Creek, Water House on Main Street scores big points for ideal setting. Getting to the ski area is a snap, even in awkward ski boots. Just walk around Maggie Pond to the Quicksilver Lift at the base of Peak 9. Or (even easier), hop the on-call shuttle from the main lobby and get off at the gondola six short blocks later. Charter Sports is onsite to fit your crew with ski/snowboard rentals and a hefty dose of “You can do this” for the hesitant ones. The shop doubles as morning/evening ski valet, keeping your boots warm and dry for the next day (and freeing up space in your condo). Evenings pretty much plan themselves, with the heated outdoor pool and seven hot tubs ready and waiting for your grand return from the slopes. Reserve the 16-lounger private screening room for a special treat, or gather for drinks in front of the fireplace in the Pioneer Club overlooking Peak 9, swapping wildly embellished versions of the day’s most epic wipeouts. Beautifully appointed two-bedroom vacation homes are so inviting, it’ll be even harder to say farewell when the time comes. Premium finishes abound, from custom wide-plank flooring and soaring ceilings, to private decks and a natural stone fireplace. (The perfect place to finally finish that half-read book that’s been sitting on your bedside table for months.) The gorgeous gourmet kitchen impresses, with gleaming glass tile backsplash, granite countertops and stainless steel appliances. Dish up plates of French toast and sausage before tossing in a load of laundry (detergent’s complimentary), and heading out for the day. Later, drop your gear with the ski valet, and recover from your powdery back bowl adventures with a long-as-you-like soak in the European-style tub in the master bath before venturing out in search of dinner. 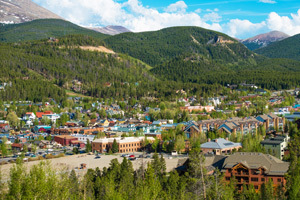 The throwback charm of Victorian downtown Breckenridge is at your doorstep. Stuffed to the gills with art galleries, bistros and boutiques, it’s definitely worth multiple strolls to take it all in. Lace up skates and glide around Maggie Pond, or check out the nearby night-tubing scene. Save a day for dog-sledding or double up on snowmobiles and hit the endless miles of trails. Summer is equally action-packed, with white water rafting, horseback riding and the alpine slide at Breck Summer Fun Park.